Watching a movie on television Saturday night qualifies doctors for two CME credits. 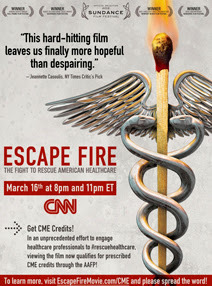 The film, ESCAPE FIRE: The Fight to Rescue American Healthcare, addressed possible reforms to the current medical system. ESCAPE FIRE will be broadcast on Saturday, March 16th at 8 p.m. and 11 p.m. ET on CNN. ESCAPE FIRE examines how American health care is delivered via a patchwork of facilities, practitioners and insurers. Real-life doctors are interviewed to highlight the pressures placed on providers to reduce costs and limit patient interaction time, and the frustrations of patients struggling with preventable conditions that are often created or exacerbated by insufficient or inappropriate care. In addition to interviews with primary care physicians and patients, former Administrator for the U.S. Centers for Medicare and Medicaid Services Don Berwick, MD, and the former director of communications for CIGNA, Wendell Potter, explain the impact of for-profit interests that guide an uncoordinated care system that focuses more on disease management than disease prevention. A half-hour roundtable discussion led by Sanjay Gupta, MD, centered around the main themes in the film, will start immediately following the broadcast. Those who miss the broadcast but still would like to view the film and complete the assessment for CME credits can buy a DVD or download the film from iTunes, Amazon.com. The online assessment for the CME activity is online. The Enduring Material has been reviewed and is acceptable for up to 2.0 Prescribed credits by the American Academy of Family Physicians, with certification beginning March 11. Term of approval is for one year from this date with the option of yearly renewal.